Scranton has always been strangely profitable, so when Dunder Mifflin goes under they'll set out on their own. Very funny episode. looking forward to seeing Dunder Mifflin Draper Pryce in Season 7. Feels like the show has re-obtained its groove- was worried a few weeks ago that the wedding (which eopisode I had serious misgivings about) episode and Mafia followup signaled a return to Season 4 mediocrity, but really liked these past 2 episodes, even though last week's was close to being too uncomfortable/cringe-inducing. Am looking forward to seeing how this financial crisis works out. Any one have any idea why Ryan's outfits keep changing? The look on Creed's face when Michael told him "there's been a murder and you're a suspect" slayed me. Did Pam become less pregnant? when they panned over to Pam at the stand off scene I couldn't stop laughing. she played it so well, complete with the "get my keys start the car". Loved the Dexter-ish crime scene recreation. I don't know why, but Creed saying "Great, let me just settle in" and then booking it out, while completely predictable, sent me into a fit of laughter unseen since the stupid Peter Pan sketch on SNL last year. Just giddy with laughter. I feel like they've set that joke up for five years. Perfectly executed. The Creed gag was great. How many other people are able to make such an impact with so little actual screen time. What was that, maybe twenty seconds total? The Michael Scott Paper Company rides again? Funny ep. I died inside with the Andy stuff, and loved Creed fully acting out the old Simpsons joke. The Mexican standoff was inspired, and even though South Park did a similar situation with sticking to the character, I'll be damned if Steve Carrell didn't charm me over. Ryan seems to be turning into a hipster d-bag right in front of our eyes. It fits with the character, he's just changing his style to fit in with d-baggery. I liked this episode just a little bit less than last's week's. The show did a decent job of the staff taking a silly approach to a potentially disastrous situation. It'll be interesting to see how this pans out. In the meantime, I enjoyed watching everyone get caught up in the game, particularly the standoff at the end. Michael, Jim, and Andy would be obvious choices to do this, that's probably why it was so funny to see Pam with her "guns" drawn. I think everyone knew what was going to happen when they showed Creed arriving late to the office that day, but somehow, it was no less funny to watch it happen. Thus is the comedic genius of Creed. Was tonight the first talking head for Ellie? She may have had one last year when she started working at DM, but I sure don't remember one from this season. Overall, a very VERY close 2nd to Parks, simply because this episode was one of the best of the season. I think everyone said all the funny parts. But what really got me was the moment where Jim and Michael compared themselves to parents. And Michael as the mom doing things for the kids. That scene just explained the co-manager scenario to a T.
While I thought the ep was funny, nothing gave me a bigger laugh (and, strangely, anticipation) than drbluman's suggestion that we can look forward to looking forward to "seeing Dunder Mifflin Draper Pryce in Season 7." Or was that too soon? Let's not forget that when Pete lands the big account, they will have to change to Dunder Mifflin Draper Pryce & Campbell. I think Ryan said something about trying to figure out his style (or something) in the fedora episode. I absolutely love Ryan's different outfits! Each one cracks me up, and how they get in a little gag/dig at Ryan's character without saying anything. Tonight's was even funnier than the fedora, and the fedora was awesome! Also, like everyone else, I thought the end scene was hilarious, especially Pam. Go Beasley-Halpert! I really wanted Erin to be a special exception to the documentary, as I thought she worked very well with a little mystery. If they're going to make her as crazy as the rest of the office, though, then a "funhouse mirror version" of Pam is a good way to go. Ellie Kemper certainly nailed the talking head. I'd love for the show to use her and the Nard-dog to parody the PB&J romance even more overtly. Creed is magic. 'Nuff said. I admired that the episode could have been a total disaster, but instead of hedging their bets they went full throttle on the murder mystery, Southern accents, and refusal to break "characters." And I think the episode was a lot funnier than if they had only gone halfway. Every time they added another ridiculous name or accent, it got better. In a sense, the bankruptcy has been looming since the pilot, but in the short term it did come out of nowhere...a few lead-up hints would have been nice. From David Wallace's comments, it looks like they'll return to it in a few episodes and play it out the rest of the year. As Oscar pointed out, bankruptcy covers a wide range of options (see Chapter 7 vs. 11). My guess is, Dunder Mifflin undergoes Chapter 11 and everyone keeps their jobs temporarily while the company tries to restructure, with some kind of season finale resolution/cliffhanger. I like the Andy/Erin story, as long as it's not a Jim/Pam rehash. It would help if we knew a bit more about Erin - as Ryan W pointed out, she's had maybe one talking head since coming on board. Although I remember someone saying a lot of her stuff gets cut (Meredith syndrome). If Mad Men existed in the Office universe (and who's to say it doesn't? ), is there any doubt Don Draper would replace Michael Scarn as Michael's alter ego of choice? I'm pretty sure we've already seen him give a Carousel-style pitch for paper. drbluman, if it were physically possible, I would have your babies. As for the rest of the episode, it was the kind of comic absurdity that I find kind of okay-ish. For me, the highlights were Creed's bit (agreed with the rest of the crowd--its predictability didn't undercut its hilarity at all), the open, the tag (the moment they cut to Pam I nearly doubled over), and Oscar trying to explain the goings-on at DM in an unsuccessful Savannah accent. I would've given up the Erin talking head--which only served to reinforce what I think was pretty obvious--with an extra few seconds of Andy's talking head. For all the things he listed about it being weird if he were asking Erin out in-character, he never pointed out that they were brother-sister in game. Maybe Nelly IS into that freaky stuff. For me this, along with the wedding episode, was by far the best of the season. This was also definitely the best of last nights NBC comedies. This is an episodes that was so ridiculous it could have been a very bad episode but everything clicked so instead it was one of my favorites. I also want to acknowledge that whenever Ed Helms gets a lot of screen time, whether its in The Hangover or The Office, he steals the show. Really haven't been digging this season for the most part. And borderline hated the wedding episode. But I quite liked this ep. Very simple and just fun. I find the two biggest keys to my enjoyment of this show now are keeping Michael from being too incompetent and idiotic, as well as making sure Jim and Pam don't come off as the better than everybody else cool kids. Seems whenever the show is able to stay away from those two issues, I find myself actually enjoying the show. Which I did tonight. Oscar trying to do the southern accent, and it coming out in falsetto had me rolling. Had to rewind it twice. I also loved Ed Helms explaining the difference between Savannah southern accent and the Florida panhandle. That may be because I'm from Florida and some of my best friends from college have these bizarre southern accents. Before I went to school I had no idea there was a panhandle accent. I laughed till I cried at Oscar's attempt at a Southern accent. I rewound twice because it was so hilarious. I know it's not the same, but I feel the creators of the show have successfully hooked me into Andy and Erin as the new PB&J from seasons 1 and 2. Does that make me a sucker??? I don't like the "Michael does something that Jim thinks is stupid, but which turns out to represent the height of Michael's peculiar managerial genius" -- especially when they're set on lather-rinse-repeat. It seems to suggest that rational thought is no match for whimsy. That's...not a world I want to live in; and it makes for a world I don't care to watch much of, either. Every character was on point tonight. And I can't say it enough, the show doesn't get any better then when the whole cast is involved in the central storyline. Also, we need more Kevin! Another funny scene was Michael and "tube city." That has me in stitches. This season is really picking up! Alan, really wanted the jump-off to be "right after the Wall-dog takes matters into his own paws"
The best scene in the episode was at the very end, when Michael drops the Southern accent and says with flat sadness "I have never, ever worked harder than I did today" and Jim looks at the camera with what I interpreted as a mix of "that says a lot about how you normally handle business/BUT under the circumstances not only are you telling the truth, you handled the catastrophe of today better than anyone else on Earth could have" without saying a word. Very curious to see how they will keep the show going, and it's not a given that D-M will survive so it'll be an original take for certain. "I'm not going down for this!" Mrs. Halpert was cracking me up last night. Great ep. I'm interested to see what direction the writers are going to take with the DM financial troubles. Right at the end of his phone call with Wallace, Jim mentioned something about working on a big supermarket proposal - I wonder if that will come into play later. @Big Ted, you bring up a good point about Andy's timidity in dealing with Erin. My guess is that the Angela fiasco burned the Nard-dog more than he wants to admit and he's feeling a bit less sure of himself this time around. Wow...I thought this ep was awful. The Creed moment, which I saw from two miles away (as soon as he drove up in his car), was the only thing close to a laugh in the episode. This show is very close to having run its course. I enjoyed this episode. even though I saw the Creed gag coming, I laughed anyway and seeing Pam at the end was amazing but something has seeemd off with The Office all season and this show felt off as well. I laughed; it was funny, but something just seems...off. Can't put my finger on it. For as long as Andy has been on the show they keep dropping hints that he might be gay... does anything thing they're ever going to do anything with that? I can't remember laughing out loud at anything this season until last night. Oscar's "accent" was beyond funny and even though Creed's reaction was pretty much a given, I still thought it was hilarious. One of the fun things about shows that are character driven is that you don't always have to be surprised to be entertained. The "mexican standoff" at the reminded me of the classic gunfight from Spaced, one of the best things I've ever seen on TV. This could have been great in its own right, or great as an homage, but I liked it a lot, too. Maybe the company will be bought...? ...by PPL? For as long as Andy has been on the show they keep dropping hints that he might be gay... does anybody think they're ever going to do anything with that? Regarding the earlier comments, I don't think Andy's character was A) conceived with a character outline to be gay or B) is going to be developed as gay in the future. He's a very ineffective heterosexual and his "gay panic" in the season premiere reflected the way he flips out over anything he can't understand (long list that!). To the extent Andy's "obviously" anything, it's socially stunted and reactionary. This episode was definitely on the high-end of this season. The Creed joke was almost too predictable to be funny, but they could make it the best joke ever if we never see him again. Oscar's attempt at the accent was the best part of the episode, probably. Yes, that's my take. He's got to be feeling so gun shy after all the heartbreak, humiliation, wounded pride etc. that happened with the Angela mess. I can definitely understand his hesitancy and caution with Erin. And I'm *loving* the storyline! Another solid show. Any episode that gives Ed Helms a lot of screen time and ends in a *Mexican Standoff* - well, how can you possibly not love that? And I'm usually not this guy, but I have to say it: I - love - Erin. Just something about her. ...There. It's off my chest. I am not a big Creed fan and usually don't find his stuff to be funny. This is strange, because I like and laugh at most other characters in the show. So naturally I thought the Creed bit in this episode was way too predictable and fell flat. Now, on the other hand, Oscar trying to talk in a southern accent, now that was comedy gold! "He lives on Sesame Street, dumbass!" Kevin is great! I also think Jim's supermarket ploy will come into play later on. And if his idea saves the company, Dwight will lose it, which should be fantastic. Ok, I might have missed something, but I don't think so... 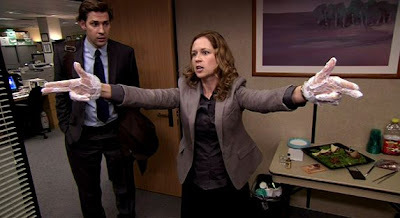 So can anyone tell me why Pam was wearing plastic gloves this entire episode? I thought it was a prop for her character like Kevin's cigar. They weren't plastic gloves, they were lace, like a southern belle on a plantation long ago. Episode was okay---Oscar's accent was very funny. They've played the "Michael acts wacky, Jim gets exasperated" note 50 times now...time to move on. Ellie Kemper should have been in this cast since day one. Her misunderstanding with Helms was one of the best pieces of tragicomedy I've seen in years. Kudos to the writers for leaving it on a sad note and not sticking a punchline onto the end of her "diary room" segment. I love that the Nard-Dog was so focused on doing impressions of correct dialects that he didn't know who the Swedish Chef is. Ellie Kemper is great. I love that the writers didn't just bring her character in full force at first. I am rooting for Andy to find some happiness. Did no one else love that Michael lured Angela back into the game by saying they had 'Baby Carrots'? ..The whole "Mama Ju Ju Whatever" was funny too. The cheap looking prop turban and shrunken skull..
"The one you medium suspect"
I laughed at the Creed bit even though like everyone else I saw it coming 2 miles away. I'm tired of Michael's "managerial genius". This season his antics are pretty annoying for the most part. I'd prefer if they just had him falling apart - that would make more sense to me - but they always seem to pull the "managerial genius" bit out of the hat at the last minute. Give me a break. The show is starting to feel tired and directionless, with only moments of glimmer. Liked the Creed bit. Liked Oscar messing up his accent. Liked them all having a go at the accents (they seemed to be having fun as actors acting like actors). Oh, by the way, the Stanton branch is not profitable - it's only the writers saying it is, and that's the slip that is starting to show. I can't add a ton to the what's been said. The Creed and Oscar bits were great, of course. Tube City was a hilarious visual gag. Personally, I thought it was the best episode of the season so far. It also kind of liked the parallels between Michael doing something like this and Jim's Office Olympics. Same concept, but on different sides of the management line. My personal favorite bit from the episode was Kevin's enthusiastic (and completely unoffended) response to Michael's suggestion that someone that he could say he'd been kicked in the head by a horse. It's not managerial genius exactly, but his management style is actually pretty good for the office. They have a really good sales staff that tends to have unusual methods (remember the episode in the 3rd season where they all go on sales calls? ), and he just lets them do their thing for the most part (except for the pointless meetings, I guess). One thing I liked about the Michael Scott Paper Company arc was it showed how a more competent person like Charles Minor could actually be a worse boss. Pretty much all while he was there was mess with the sales staff and institute a more strict dress code. One of my professors was talking about how middle managers tend to be great salesmen with no people skills, so Michael being in the position he is might not be that unrealistic. I didn't really consider this to be a typical episode of unconventional Michael Scott managerial genius. The thing is, Michael thinks he's doing the genius thing, but he's actually panicking...he wouldn't even take David Wallace's phone call. I think Michael was out to lunch in this episode, his 'working hard' bit at the end was an attempt at saving face. "Michael thinks he's doing the genius thing, but he's actually panicking...he wouldn't even take David Wallace's phone call." I totally agree with Mike S. that no one "needed" the Murder Game more than Michael did. I don't think I've loved the Michael Scott character more than in this episode. Can totally relate on the love of murder mystery games (HUGE VCR "Clue" fan), which is admittedly both sad and dorky...just like M. Scott.